It’s currently Sunday, 8.30am, and I’ve been awake since 7am having so far spent a week exploring in Protaras, Cyprus and staying in a traditional little town just on the outskirts. Lazing around reading my book with a fresh cup of coffee, enjoying the quietness whilst everyone else still sleeps, all I can hear is the sea behind our villa and the twittering of the morning birds in the trees. Oh… and an air-siren! Yep, freaked me out a little, not gonna lie! At exactly 8.20am this morning a very loud siren was ringing through Kapparis and I had absolutely no idea what was happening. Not a clue. I looked around half expecting the rest of the villa to wake up, they didn’t, so I ran upstairs as quietly as I could and peered out over the balcony. Nothing. No people coming out of the neighbouring villas, nobody running around wondering what the heck was going on… just little me in my pj’s trying to figure out the source of the noise! After a minute or so it stopped so I ran back down and sat in my comfy spot on the shaded terrace and Googled. Turns out that at this exact date and same time every year the siren sounds in memory of the Turkish invasion in 1974 and pays tribute to those who lost their lives during the coup. Ah, okay… all now makes sense. Cyprus is a beautiful country, officially the Republic of Cyprus, it’s an island country in the Eastern Mediterranean and the third largest and third most populous island in the Mediterranean. I’ve been twice before, when I was younger and I’ve always wanted to come back. Mainly as back then my days consisted of sleeping and sunbathing, and my nights drinking and being covered in foam/neon paint or gold glitter, and whilst I’ll never regret that party stage, I do regret not going out and seeing more. Cyprus is steeped in history, it’s known for its glorious beaches and hot weather, tourists flock here for the holidays, and when I say flock here, I mean take over…! It’s seriously popular. 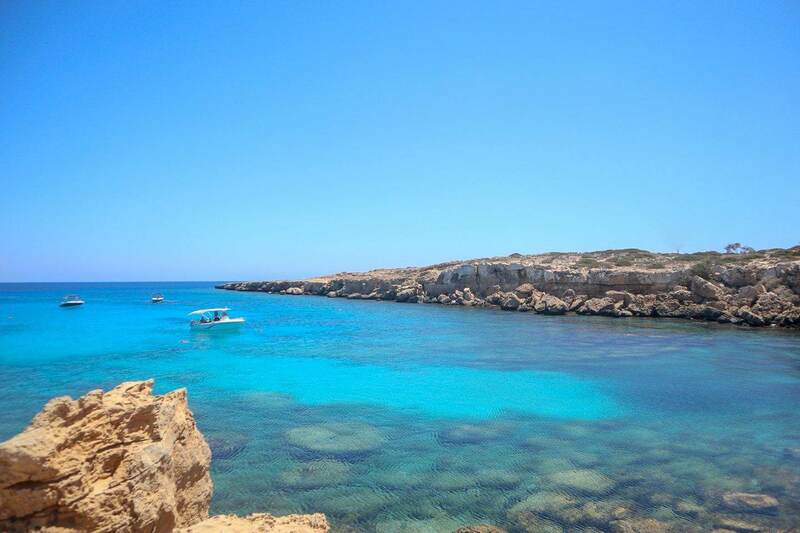 I couldn’t ever imagine staying in the party town of Ayia Napa. Been there, done that, bought the t-shirt (more than once, see above) in my younger days and I know I’ll never go again. There are more pretty towns and villages hosting all sorts of traditional holiday villas, boutique B&B’s and pretty coastal properties to enjoy and appreciate. Cyprus is so much more than just a party island. Hence why we’ve chosen not to stay in the thick of it. Kapparis is untouched and unspoiled. A small village where the community is very friendly and where the locals make time to speak to tourists and holiday makers with an attitude that is welcoming and friendly. The atmosphere is very relaxed and laid back, which makes it the ideal place for a chill out and get away from it all type holiday. The beach is a five-minute walk away and I wake each morning to the sea just outside my window. I have a balcony where I can throw open the doors and watch the sunrise each morning. Can you get a better start to the day than this? I really need to chill on this holiday, take a step back, sleep, laze, laugh with my family… with the total intention of switching off from work as much as possible. I hadn’t planned to blog about Cyprus either, but after one week of being here we’ve discovered so much, and I just knew it would create some good content. I’ve decided to write this post as a little introduction, then I’m going to cover what we’ve done on our days out with our hire car, and include a quick post about the best restaurants we found. There are hundreds of restaurants close to where we’re staying. Hundreds. Quite honestly, not all are great, some are complete tourists traps and we unfortunately did have a couple of bad experiences, but, in the end, we spoke to a few locals, made friends with a fab taxi driver and found some absolute gems. If, like me, food plays a huge part of the reason you choose a holiday, then Cyprus won’t disappoint. Everything is fresh, the flavours are incredible and y’know… it is the home of halloumi! Being a veggie in Cyprus is easy too, I’ve never felt so healthy. Even thinking about the food now makes my mouth water. Granted, before I came I did have a Google and an Instagram search but didn’t come across anything that particularly stood out, so I knew that we’d have to do a little of our own exploring and figuring things out. Which is fine, I love an adventure and the opportunity to explore. The most touristy thing we’ve done is go to the water-park, which to be fair was lots of fun! My son loves a water-park and no holiday is complete for him without spending a day at one. Every year my Mum books a villa for us all. All includes my two brothers, my sister, me and our children, so there’s 8 of us altogether. No husbands or boyfriends, just us. Not that my Mum doesn’t love Steve, she thinks he’s great! But if he was here I’d spend my time with him and the group just becomes too big. We hole up with no set plans, just a “let’s see what happens” kind of vibe with a chilled out attitude and one thing on our minds: fun. We all live in different parts of England. My Mum still in our home town of York, my sister, nephew and niece the closest in Tadcaster, one brother in Sheffield, one in Lincoln and then me and my son Coby down in Wokingham. We see each other throughout the year, but never altogether, and this is our chance to all catch up and be in the same place at the same time. It creates memories we’ll all remember forever and I consider myself very lucky to have a family that can come together the way we do. Home for the week is this lovely, traditional Clickstay villa. You may have spotted that I’ve worked with Clickstay before on press trips, I won a blogger comp with them two years ago and am pretty sure I’ll be a fan for a long time to come. (This isn’t a sponsored post, I recommended Clickstay to my Mum before she booked) and I always stand by my view that I’d never review or promote anything I wouldn’t pay for myself. I’ll also do a separate blog post on the villa and give you a little insight as to where we stayed. The villa itself and the service from Clickstay is, as it always is, excellent. We have however had a few issues with the management company of the villa, nothing too bad, just niggly things that you shouldn’t have to deal with when on holiday. Staying on the East side of Cyprus meant that the city of Paphos, the town of Limassol and Mount Olympus are quite far away so I knew before coming that we’d not be seeing some of the famous sites like the Tombs and the archaeological Roman mosaics, but I did quickly find out that there’s so much to be discovered around where we are staying. Whilst I’m totally cool with driving around I haven’t wanted to drive too far away, and I feel like where we are is such a beautiful enough place that it would be a shame to not give it the attention it deserves. We’ve hired a car with the intention of getting out to find something different. So far this has included some amazing beaches, we’ve swam and admired the views at Cape Greco, climbed to historic churches, one being in a cave, drove to pretty towns where we sat and ate tzatziki and endless meze feasts, watched thrill-seekers jump from cliffs in the turquoise waters below, climbed in sea-caves and admired the gorgeous and incredible Bridge of Love just outside Ayia Napa. Have you been to Cyprus? Did you love it? What did you like the most? Keep an eye out for my first post… coming soon! "A Wedding Cake at Combe Manor Barn"